The torrential rains that fell on the coastal Black Sea town of Krymsk, Russia, in July 2012 shouldn’t have been possible. In the historical records, there is nothing like the 6.7 inches of rain that fell in the area in less than a day, causing catastrophic flash floods that led to the deaths of more than 170 people. 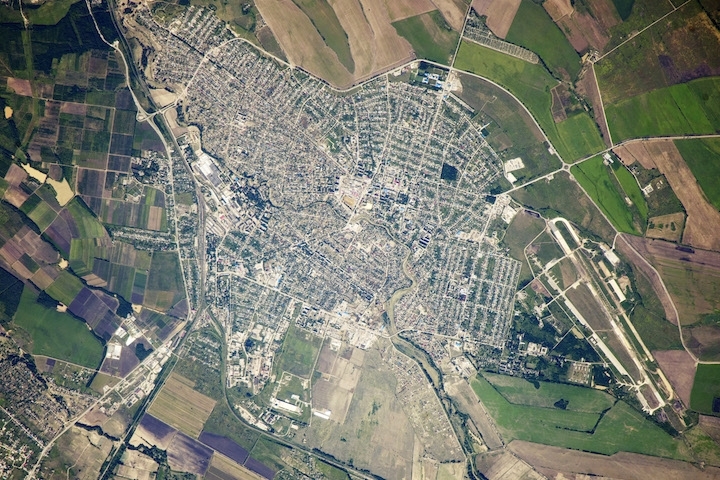 A view of Krymsk, Russia, taken from the International Space Station on July 10, 2012, just days after an unprecedented rainfall event dumped 6.7 inches of rain on the city, triggering deadly flash floods. One team of scientists says that it has an explanation for the unprecedented event: the clear rise in Black Sea water temperatures in recent decades fueled the explosive convection that led to such intense rains. They found that those higher sea surface temperatures resulted in a 300 percent increase in rainfall compared to what would have been possible just a few decades ago. “We don’t say that this is 100 percent due to anthropogenic factors,” study author Edmund Meredith, of the GEOMAR Helmholtz Centre for Ocean Research in Kiel, Germany, said, as natural variability could have played a role in the warmer waters. But a “considerable amount of it” was. Such effects of warming waters on convective storms could be found elsewhere around the globe, the study authors say. The outsize rain event was the result of a low-pressure system that had formed around the Caspian Sea and subsequently tracked slowly over the Black Sea. The slow movement over water allowed the storm to pull in plenty of convection-fueling warm, moist air, and, as the system met the foothills of the Caucasus Mountains, where Krymsk is situated, that air was lifted upwards — the initial trigger of the intense convection. The storm then entered a self-fueling cycle: As the warm, moist air quickly convected upwards, it pulled in more such air from over the sea, causing more convection. While “it’s not uncommon at all to see convective events in this area,” Meredith said, the sheer intensity of the event was what set it apart. The rains it caused were “more than twice the size of anything in the previous record,” he said. It was that clear departure that prompted Meredith and colleagues in Russia to wonder if the warming of the background climate fueled by human greenhouse gas emissions set the stage for such extremes. Traditionally so-called extreme event attribution studies have used global climate models and observations to calculate the changes in the likelihood of events like heat waves due to warming. But precipitation events are much trickier to pick out, particularly when they are very local, like the Krymsk event, as global models can’t adequately resolve smaller-scale features like individual storms. For their study, detailed in the July 13 issue of the journal Nature Geoscience, Meredith and his colleagues used a higher-resolution regional climate model that could accurately capture the storm and looked at what happened with and without the observed 3.6°F rise in Black Sea temperatures since 1982. What they found was that even just 30 years ago, the exact same storm would not have undergone the intense convection that it did, resulting in less than an inch of rain over the area. Effectively, the warming waters increased the rain produced by such a storm by 300 percent. That’s far and above the additional 20 percent that would’ve been added just by the increased moisture in a warmer atmosphere, which is usually the effect of climate change most cited for extreme rains. A person holding an umbrella looks at a partially submerged truck on a street in Sochi, Russia, after torrential rains fell on June 25, 2015. Noah Diffenbaugh, a Stanford University climatologist who has conducted attribution studies, but was not involved with this effort, said that the study shows how important it is to understand the key processes that lead to an extreme event in order to know where to look for the effects of warming. Breaking down the situation even more, the researchers looked at the effect of the incremental temperature increases that would have happened over the decades and found that certain temperature thresholds resulted in the ability of such extreme storms to form. Effectively, the higher sea surface temperatures are loading the dice, “making it more possible for these sorts of intense events to be triggered,” Meredith said. In fact, another such event happened on June 25 of this year, just down the coast in Sochi, where the 2014 Winter Olympics were held. And the effect likely isn’t confined just to the Black Sea. In principle, “this sort of reasoning should apply to any sort of coastal regions that are affected by intense convective events,” Meredith said, for example, the Mediterranean or the Southeast United States.